The preservation of biodiversity and the search for unusual varieties have resulted in the cultivation of rare hot chillies and sweet peppers. They are special plants for color, flavor, fragrance and levels of pungency. 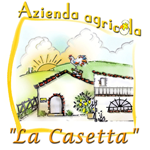 They are cultivated at "La Casetta" according to the rules of organic farming. The desire to enhance aromas and flavors ever taste in these types of vegetables and the ability to store them all the years have led to the creation of hot sauces or pates and of vegetable with oil. The sauces are made from a mix of sweet and hot peppers carefully chosen to give unique flavors and scents. The flavors and aromas are given only by the selected varieties; no added flavorings or other vegetables. The preserves are made from fresh vegetables properly processed, selected and preserved in quality extra virgin olive oil, 100% extra virgin olive oil! 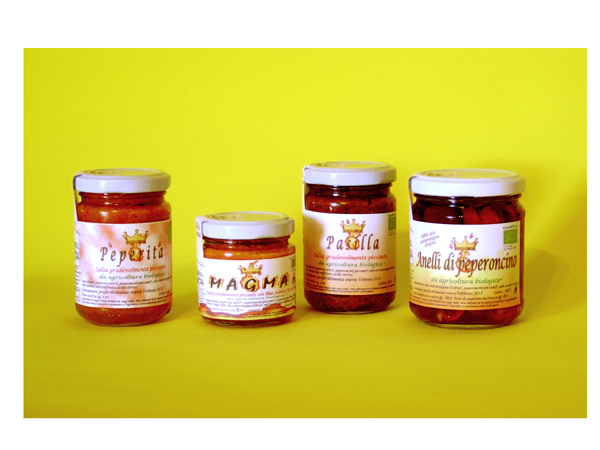 Peperita: pleasantly spicy sauce with classic taste of pepper but with subtle citrus notes. Suitable for bruschetta, cheese and sauce on the pasta. To try it on boiled meat and shellfish. Pasilla: medium spicy sauce with special scents where you can find hints of tomato and dried fruit and hints of dark chocolate. To try, as well as on toasted bread, roasts and grills. Magma: very spicy sauce made with Bhut Jolokia, the ghost chili, and Dorset Naga. These are the hottest peppers in the world. Due to its high level of spiciness it is recommended to trained palates. Rings of chili: hot cayenne peppers cut into rings in extra virgin olive oil quality. To use on bruschetta or on pasta. Do not forget to also use the oil!